Authors in today's environment are finding that they have to be their own marketing and public relations department. Many could use some guidance with these skills. This book grew out of a workshop I have done for local writer's groups. Having a game plan to garner reviews will certainly get better results than doing nothing. This book will help you find some avenues you may not have thought of, or didn't know about. I am giving this book 4 strong stars. It is packed with a ton of information in an easy read. I was surprised with the amount of information in this book. 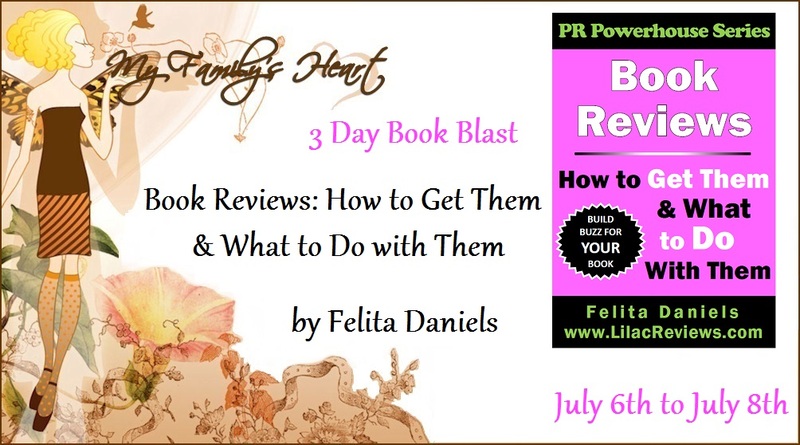 Getting reviews is difficult for many authors and publishers. It is so important to get reviews on your books in order to get them seen by more readers via Amazon, Goodreads, Barnes and Noble, etc. This book contains many links that can and will help. With the world of reviewing always changing it was nice to see some things I did not know. Do yourself a favor and check out this book if you are an author looking to get more exposure/reviews for your book. Take some time and click through the links and check it all out. Keep it handy so you can go back through it later also. You will want to. Thank you so much for sharing about my book with your readers. There is so much to learn and do. It doesn't stop after you upload your manuscript to a vendor site! If just one or two things in my book help a fellow author, I am proud to have put it out there. I think it is wonderful that you want to help fellow authors! Anything I can do to help I will.